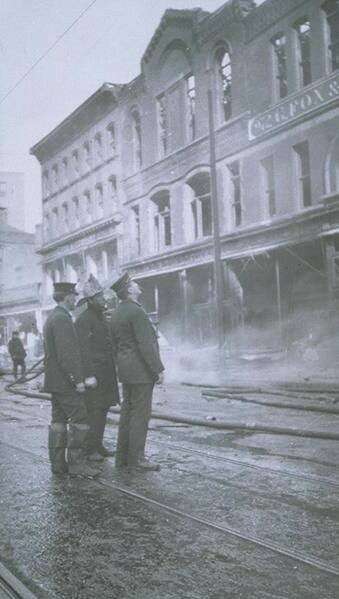 On January 29, 1917, at about 11:00 pm, watchmen discovered a fire on the ground floor of the G. Fox & Co. building complex located on Main Street in Hartford. The fire spread quickly and firemen had difficulty controlling the blaze. The building, constructed of brick, wood, and metal, burned for nearly 18 hours, and although no one was seriously injured in the fire, it destroyed the complex and its contents. The building complex on Main Street had grown from a two-room store opened by German immigrant Gerson Fox in 1847. His small shop proved to be hugely popular and in just a few short years the store expanded, and with Fox’s son Moses on board, the business continued to grow to a 5-store complex by 1915. The fire’s destruction in early 1917 left Moses Fox undeterred. The company hired renowned architect Cass Gilbert to design a new state-of-the art building. 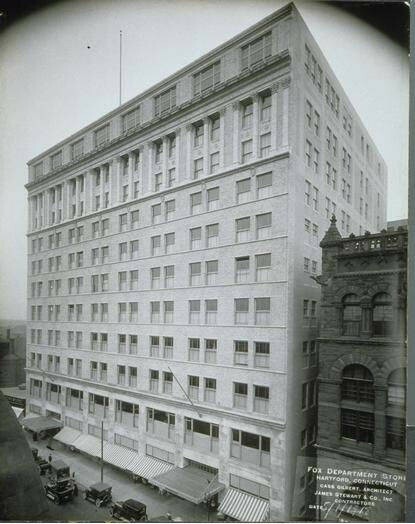 Gilbert’s neo-classical design for the G. Fox & Co. building totaled 11 floors and loomed over the street’s existing buildings. G. Fox’s popularity held steady through the first half of the 20th century, and Moses’ daughter Beatrice, who took over the presidency from 1938 to 1965, ran the company with integrity. A civic-minded and philanthropic executive, she was well-loved by her community. In 1965 the May Department Stores Company acquired G. Fox & Co., and in 1993 the flagship store in downtown Hartford closed for good. For years, the former G. Fox building laid vacant and abandoned until private investors teamed with the state to rehabilitate it for use as the Hartford campus of Capital Community College, retail shops, and offices. Today, the restored building exhibits much of its original splendor and is listed on the National Register of Historic Places as part of Hartford’s Department Store Historic District. “Remembering G. Fox & Company.” Connecticut Historical Society, 2017. Link. “Finding Aid to Fox Family and G. Fox & Co. Collection.” Jewish Historical Society of Greater Hartford, 2017. Link. “Finding Aid to G. Fox & Co. Employee and Other Business Records.” Connecticut Historical Society, 2017. Link. “G. Fox & Company and the Fox Family - Collections.” Connecticut Historical Society, 2017. Link.